New Posh signing Hayden White with new Posh manager Grant McCann. Photo: Joe Dent/theposh.com. New Peterborough United signing Hayden White hopes he has finally found a place he can call home. 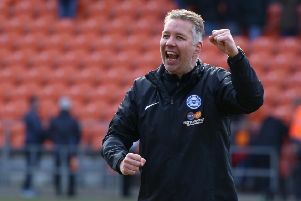 The 21 year-old right-back became new manager Grant McCann’s first Posh signing on Monday (May 16). White had been on loan at Blackpool last season. He’d previously been loaned out by parent club Bolton to Notts C, Carlisle and Bury. Bolton released White at the end of last season and Posh signed him eight days after he’d played well for Blackpool at the ABAX Stadium. White, who has signed a two-year contract with the option of a third year, said: “I need to settle down somewhere. I need a place I can call home. “I love playing football, but moving from club to club is not easy. “I had interest from other clubs, including ones who play in a higher division, but it didn’t take me long to agree to come to Peterborough. “When I met the manager he said all the things I wanted to hear. “He is ambitious and he wants his team to play exciting, attacking football which suits me. “Right-back is my best position, although I have played centre-back. I like to get forward as often as I can. White has made 48 Football League appearances, 29 of them for Blackpool last season. McCann, who has also lined up a deal for a new left-sided central defender, said: “Hayden is quick, strong and athletic. He was impressive against us on the last day of the season and I moved quickly for him as I knew other teams would be interested.